Matthew Girson is out of step. In our era of split-second digital dissemination, he paints meticulously crafted still lifes that are impossible to reproduce. His subject: books on shelves. After visiting his exhibition, The Painter’s Other Library, now on view at the Chicago Cultural Center, my students emailed him a series of questions. One asked, “Do you ever hurt your eyes painting like this?” His response: “YES! I get headaches. My drawings are so pale that I sometimes go snow-blind….” Although the paintings in this show are the opposite of pale, they are, like his drawings, hard to see. All live in the darkest realm of the gray scale, with distinctions so narrow they initially don’t exist. This work tests our willingness to focus, and risks being lost in the quick looking, quickly summarizing I-saw-it-at-the-opening-but-will-look-at-the-website-later tempo that sums up much of today’s viewing. 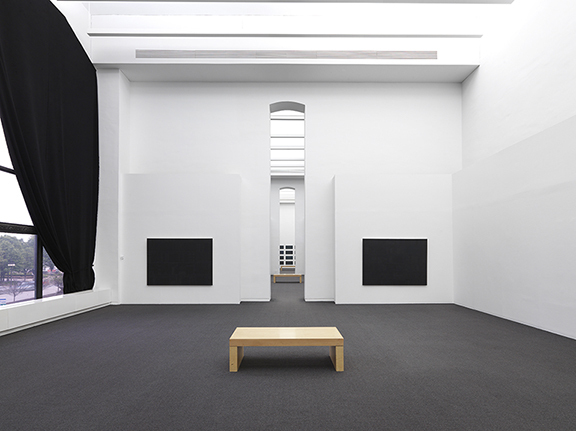 Fluorescent lighting doesn’t help, as first impressions reduce the show to elegant black rectangles hung low in the beautifully proportioned but coldly glowing space. Once filled with library stacks—the CCC being our original public library—it consists now of bright white 30 ft. high walls, looming narrow arched doorways, flat gray carpet, and enormous windows blanketed by black drapes. The effect is a stark chic. This positions the work as contemporary, but risks blanching its quiet presence. That said, these paintings are indeed present. They have the kind of intensity made through subtlety found in work meant to be slowly experienced—taken in through the senses and felt, rather than glanced at and catalogued in terms of image and idea. It was a pleasure to see my students vigorously looking; the paintings required a surprising amount of motion from us. Full frontal, back away, then stick your nose in, try to bend your eyeballs around the back of the painting to understand its construction, now angle sideways for a diagonal view, then back off again, images emerge, surfaces shift, color shifts, the space shifts, even the design seems to shift when the pieces are seen askance from variable angles. My class was enthralled by the smudged gray circles optically shimmering midst the grid of paintings in the farthest room (“a happy accident,” Matthew told us). My funniest experience—when I turned away and then looked over my shoulder, two pieces in the middle room kept dropping their stripes. The center voids expanded, which startled me. Very sneaky! If you seek out work that insists on long looking, if you (like me) are seriously frustrated that Ad Reinhardt’s Abstract Painting is still not hanging at the AIC (it’s been years); if you speed through that room filled with Richters that are always up to reach the one Vija Celmins that is sometimes up; if you find yourself flattening your head against the wall trying to understand the surface of Jack Whitten’s Khee II, then this show’s for you. You’ll note the paintings I’ve just mentioned were all done before 1980. Girson teeters on a 40 year-old edge, the now non-existent divide between representation and abstraction. A line can be drawn from Girson back to the Parthenon’s friezes, to include Morandi, Mondrian, Poussin and Piero della Francesca. Their common denominator is the subjugation of subject matter to classical structure, the belief that purity of form in a work of art will bestow profundity on its contents. This thinking shaped David’s The Death of Marat, Thomas Jefferson’s Monticello, and the fascist art and architecture executed under Mussolini and Hitler. This brings me to subject matter, and to a point in Girson’s work that I struggle with. 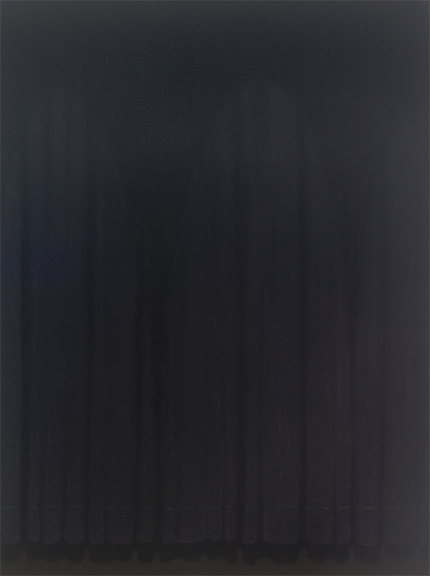 The first piece one meets in this show is an outlier, called Allegory, Allegory, Part 1, it includes a line of twenty-four 8 x 16” painted panels. They repeat, in lush glossy black troweled over smooth matt black, an image of a fire. They’re seen in relation to their source, a mostly silent video of a bonfire, a small section of Leni Riefenstahl’s Nazi masterpiece, Triumph of the Will. Girson’s goal is ambitious, to weave together the multiple uses of classicism in relationship to political thinking, from the age of enlightenment to the “endgame of modernity,” as Paul B. Jaskot calls Hitler’s aesthetic ideals and monstrous deeds, in his fine essay for this show. I’ll add, this is the piece whose idea most intrigues me, but that interests me least in the flesh. It’s the most literal, the paint refuses to transpose, and it’s the only piece I looked at quickly. Today, in representational art, it’s typical to assume that the subject is the point of the painting. A more sophisticated viewer might look for subject in relationship to idea, but the understanding of painting as visceral experience tends to be reserved for non-objective work. So Matthew’s paintings are discussed and positioned in terms of subject and idea, while their form is only considered support for those things. Thus, dark libraries and dark books represent acquired and withheld knowledge—enlightenment and repression. Geometric structure is equated with fascism, repetition with entrapment, darkness with inaccessibility, and so on. It’s assumed that Girson’s choices are symbolic, that they function as allegory. Certainly his titles support that. Yes, these layers of meaning exist in this work, but placing them in front is misleading. 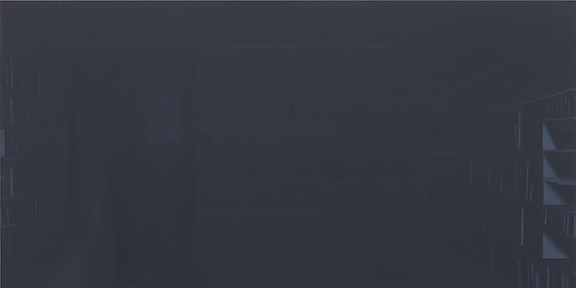 I propose that the subject of Matthew Girson’s paintings is actually light, not books. Dark light. 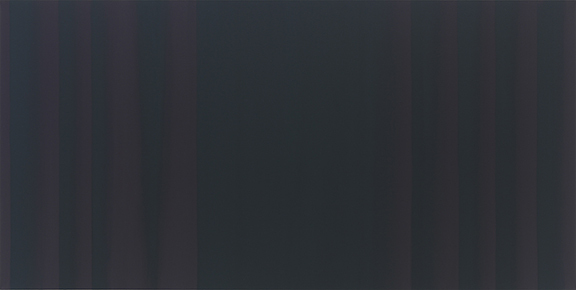 These paintings contain and emit dim luminosity. They’re filled with it. The longer we look, the brighter they become. The paradox of dark light is that over time we see more: our pupils dilate; we attune to the finest variations in value, temperature and hue, these grow through our concentrated focus. We’ve all entered dark rooms and waited as our eyes adjusted, but I’ll use a different parallel to describe this experience. Try staring through the insides of your closed eyelids. At first what you see is matter-of-fact blankness, an eclipse of your field of vision, but soon motion occurs, blooms of light, shifting shape, color, and eventually images. Stare long enough and your inward vision takes over, your sense of self, memories, the narratives of your life both public and private, all of these things exist within the intimate all-enclosing space behind your eyelids. This is where Matthew’s best paintings lie. They’re not symbolic. They’re metaphoric. Experiential. Starting with the intellect drains this away. By accessing this work first through sensory, sensual experience, the meaning deepens and opens, complex and contradictory. These pieces are best entered as we do all great fiction, imagination first. This past Monday, I visited the show again. As I looked and took notes, I was joined by the museum guard, Michael Hill. He’d just spent three days with Matthew’s work. I asked him to point out his favorites and he indicated Allegory, Allegory, Part 1 (he disagrees with me! ), saying that he didn’t understand it until he saw it at an angle. He then pointed to The House Was Quiet and the World was Calm and told me that he instructs people to “look at it from the bottom up.” We moved to the back room to look at another of his favorites, The Walls Were Full of Books, The Books Were Full of Ideas. Just then, a man walked in, looking perplexed. He asked Hill, “What are these? Holograms?” Hill responded, “No sir. These are paintings.” The man’s eyebrows contracted, “What? What! What kind of paintings are THESE!” Hill had no answer, so he smiled. The enigma of Hill’s response perfectly mirrored the mystery of this extraordinary work. Come see it. Take an hour. Look very slowly. Anne Harris is a painter who also teaches and curates. She’s Chair of the Exhibition Committee at the Riverside Arts Center, and currently teaches MFA and BFA students in the Painting and Drawing Department at SAIC. Her work has been exhibited at museums such as The National Portrait Gallery at The Smithsonian Institute and The Aldrich Museum of Contemporary Art. Awards received include Guggenheim and NEA Fellowships. She lives in Riverside, IL, just outside Chicago. Are We All Just A Giant Hologram?